The Brewster triplets have this whole school year figured out. They'll share notes and books and help plan their big sister's wedding, and they're all going to be on color guard. Smooth sailing through the seventh grade.Only nothing goes right. They're accidentally on cheer squad... read full description below. The Brewster triplets have this whole school year figured out. They'll share notes and books and help plan their big sister's wedding, and they're all going to be on color guard. Smooth sailing through the seventh grade.Only nothing goes right. They're accidentally on cheer squad, of all things. And the sisters are split into different classes--which Darby is failing because of her terrible participation grade. Meanwhile, Delaney really likes cheerleading and doesn't want just go along with what Dawn wants this time, especially on her cheering crusade. Can the triplets take turns pretending to be Darby, plan a shower for their beloved big sister, and stay out of the trouble Dawn keeps getting them into? And more importantly, can they do it without being split up for good? 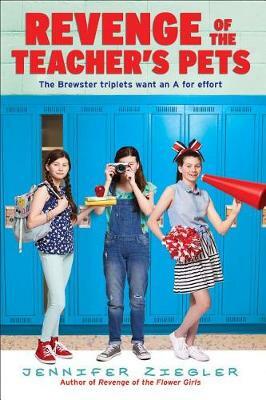 Three times the teacher's pets means three times the school shenanigans in this fun Brewster Triplets romp from Jennifer Ziegler. Like the Brewster triplets, Jennifer Ziegler is a native Texan and a lover of family, history, barbecue, and loyal dogs. Although she only has one sister, she does know what it is like to have four kids living in the same house. She is the author of several books for young people, including Sass & Serendipity and How Not to Be Popular. Jennifer lives in Austin, Texas, with her husband, author Chris Barton, and their four children.